LiDAR technology is potentially becoming a game-changing solution for industry verticals such as aerospace & defense, automotive, mining, oil & gas among others. Moreover, mounting demand for 3D imagery supporting the adoption of LiDAR technology for government applications such as railways and roadways management, forestry are driving the growth of global LiDAR market. Leading automotive players are massively investing in this business for diversifying their product portfolio and market expansion. For instance, in 2016, Ford Motor Company and Baidu Inc. together invested USD 150 million in a Silicon Valley-based LiDAR technology company named Velodyne LiDAR for commercializing the company’s laser-based sensors. Recently, Oryx Vision an Israel based company invested USD 50 million in LiDAR (Light Detection and Ranging) technology for self-driving automobiles. These investments are spurring the growth of LiDAR market. Goldstein Research analyst forecast the LIDAR market is anticipated to reach USD 5.76 billion by 2024 and is estimated to grow at a CAGR of 23.0% during the analysis period 2016-2024. 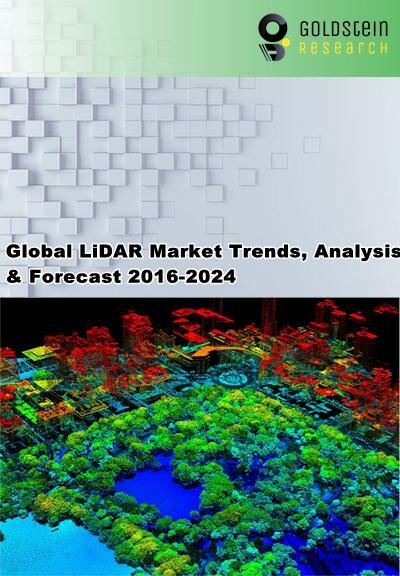 The report covers the present ground scenario and the future growth prospects of the LIDAR market for 2016-2024 along with the wide range of technological application for different energy types in every region. We calculated the market size and revenue share on the basis of revenue generated from demand and adoption rate of various technologies among end users across the globe. Based on applications, corridor mapping application holds 37.5% market share of total LIDAR market and is projected to dominate the LiDAR market during the forecast period. Moreover, data obtained from LiDAR techniques can easily be added to software platforms such as Terra, AutoCAD and Micro station which enhances the LiDAR-based corridor mapping and eventually boosting the market growth. Global LIDAR Market Outlook 2016-2024, has been prepared based on an in-depth market analysis from industry experts. The report covers the competitive landscape and current position of major players in the global LIDAR market. The report also includes porter’s five force model, SWOT analysis, company profiling, business strategies of market players and their business models. Global LIDAR market report also recognizes value chain analysis to understand the cost differentiation to provide competitive advantage to the existing and new entry players. Our global LIDAR market report comprises of the following companies as the key players in the LIDAR market: AutonomouStuff, Blom, Faro Tehcnologies, Geokno India Pvt, Geodigital and Leica Geosystems. Other high-flying vendors in the market are: Michael Baker International, Mira Solutions, Quantum Spatial, Riegl, Sick AG, Teledyne Optech Inc., Topcon Positioning Systems Inc, Trimble Navigation Limited, Velodyne LIDAR, Quanergy Systems Inc., Airborne Hydrography AB and 3D Laser Mapping. According to the report, major driver in LIDAR market is increasing exploration activities in oil & gas and metals & mining industries are propelling the need for accurate and remote sensing data with advance analytics technology. Accurate evaluation of resource, details related with the volume of the void, pit,ore body, and stockpiles along with efficient environmental monitoring and planning can easily be achieved with the help of LiDAR techniques. Further, the report states that one challenge in LIDAR market is high cost LiDAR technology based devices which is inhibiting the adoption of LiDAR devices on a larger scale. LiDAR instruments are available at huge prices which is far more than the availability of substitute technology based products such as RADAR and structure from motion (SFM). Presence of cost effective alternative technologies may negatively impact the growth of LiDAR market in the near future. Based on geography, North America is the dominating region for global LiDAR market and accounted for 40% share of the airborne LiDAR market in 2016 while APAC tends to grow at the highest CAGR of 22.5% over the forecast period. Moreover, increasing construction activities in Middle East & Africa and Asia-Pacific regions are expected to bring new business prospects for the market. What is the total market size by 2024 and what would be the expected growth rate of LiDAR market? What are the adoption rates (%) of LiDAR in every region and what would be the expected demand over the forecast period?